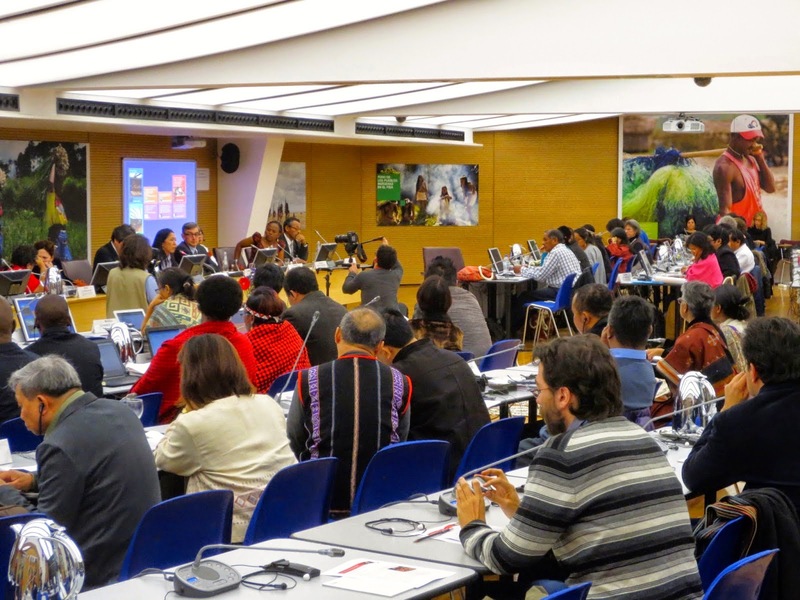 The second global Indigenous People's Forum convened at IFAD last week, gathering fifty representatives of indigenous peoples' organizations from all over the world for two full days of deliberations, with a focus on traditional food systems and sustainable development. 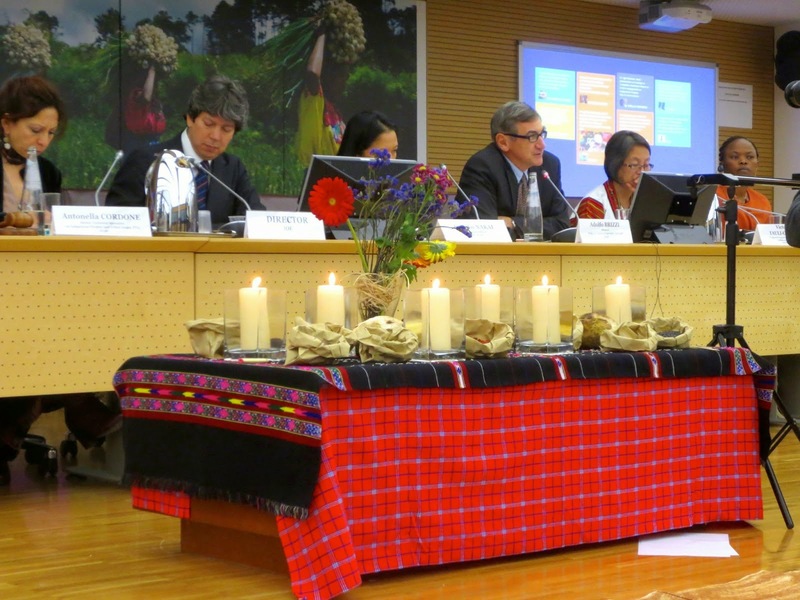 On the agenda was a presentation and plenary discussion on the key emerging findings of the Evaluation Synthesis Report on IFAD’s Engagement with Indigenous Peoples prepared by IFAD's Independent Office of Evaluation. Audience and panel at plenary discussion. Fumiko Nakai, Evaluation Officer at the Independent Office of Evaluation, presented emerging findings from the ongoing evaluation synthesis. The main objectives of the synthesis are to generate good practices and lessons, identify key issues for reflection and make recommendations for future IFAD operations. Key areas reviewed include targeting approaches, indigenous peoples’ participation in projects and strategy development, empowerment, and support to policy engagement and advocacy. The report found that many of IFAD's achievements stem from its comparative advantage in supporting the social and economic empowerment of indigenous peoples. Fumiko Nakai noted that on a global level, IFAD has contributed grants for capacity-building and advocated for greater indigenous involvement. On a country level, IFAD has influenced policy-making regarding land, empowerment and natural resources. Nakai also listed several areas of potential growth in IFAD's partnerships with indigenous peoples. First, she suggested reviewing the Indigenous Peoples Assistance Facility (IPAF), which helps finance small-scale indigenous projects. Although a powerful tool for fostering development, it could perhaps be strengthened. Some suggestions put forward were the need for good diagnostic analysis in country strategy preparation stage and project designs, the need for improved M&E at project level with disaggregated data and indicators relevant to indigenous peoples. Also, to enhance project supervision and ensure that rotating staff members working on projects fully understand the various issues that indigenous peoples face. These steps could ensure a more successful project at every phase. Adolfo Brizzi, Director of the Policy and Technical Advisory Division, cited a greater response to gender issues and better data collection as two goals for IFAD's partnerships with indigenous peoples. Brizzi also challenged IFAD to further deepen this partnership. First, IFAD staff need to understand more clearly the meaning of informed consent, a prerequisite for new policies. Few other organizations have adopted such a policy, he noted, and IFAD staff need to fully understand what it entails. Brizzi also spoke to the difficulties of engaging in policy change, warning that governments can resent third-party guidance. Brizzi concluded the panel with a call to an open mind and mutual dependence, urging IFAD and its Member States to build relationships of trust in order to best carry out each project. Afterwards audience and panel members milled about, continuing the discussion before breaking for lunch. 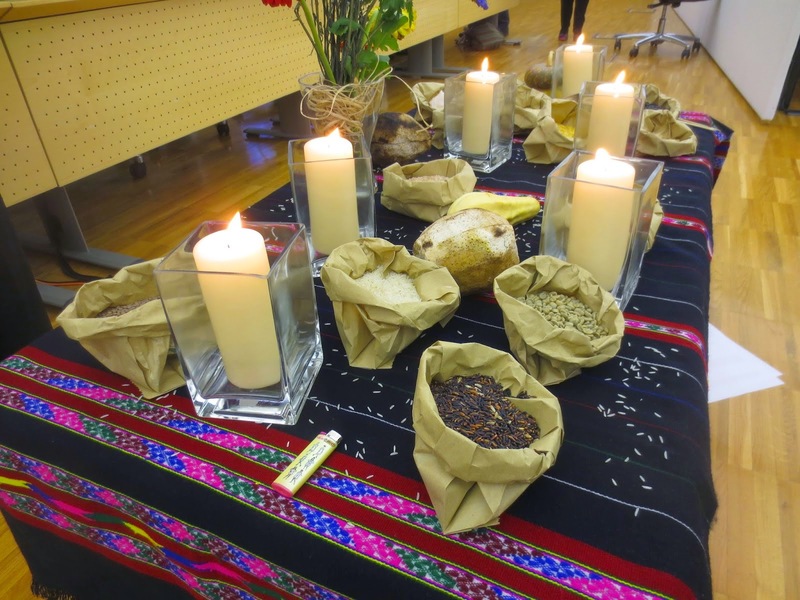 A table laden with candles and food staples from around the world symbolized IFAD's relationships with indigenous peoples.